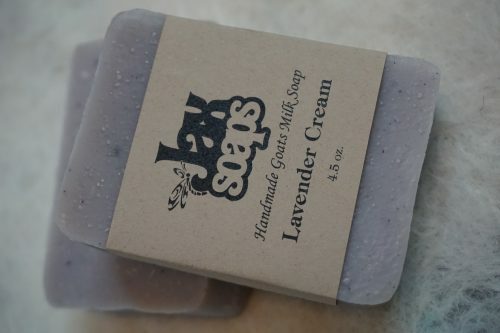 Short Product Description: This is an essential oil soap with a generous amount of Lavender and Lavendin Essential Oil and ground Lavender bud. This is an essential oil soap with a generous amount of Lavender and Lavendin Essential Oil and ground Lavender bud. Lavender is very helpful for problem skin and has an uplifting affect. There are many health benefits to using Lavender Essential oil aromatically and topically as explained below. 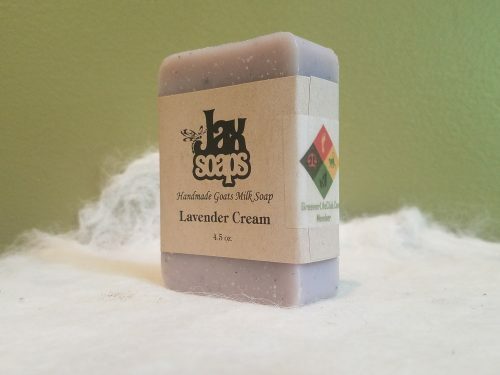 All of Jaxsoaps are made with goatsmilk for the soothing moisturizing affect the goatsmilk imparts. The health benefits of lavender essential oil include its ability to eliminate nervous tension, relieve pain, disinfect the scalp and skin, enhance blood circulation and treat respiratory problems. The Latin name of lavender is Lavare, which means “to wash”, due to its particularly pleasant aroma. Lavender oil is extracted mostly from the flowers of the lavender plant, primarily through steam distillation. The flowers of lavender are fragrant in nature and have been used for making potpourri for centuries. Traditionally, lavender essential oil has also been used in making perfumes. The oil is very useful in aromatherapy and many aromatic preparations and combinations are made using lavender oil. Lavender oil blends well with many other essential oils including cedarwood, pine, clary sage, geranium, and nutmeg. Today, lavender essential oil is frequently used in various forms including aromatherapy oil, gels, infusion, lotion, and soaps. Bug Repellent: The smell of lavender essential oil is potent for many types of bugs like mosquitoes, midges, and moths. Apply some of the lavender oil on the exposed skin when outside to prevent these irritating bites. Furthermore, if you do happen to be bitten by one of those bugs, the lavender essential oil has anti-inflammatory qualities that will reduce the irritation and the pain associated with bug bites. Sleep: Lavender essential oil induces sleep which has made it a common recommendation for an alternative treatment of insomnia. Frequent studies on elderly patients have shown an increase in their sleep regularity when their normal sleep medication is replaced with some lavender essential oil being placed on their pillows. It has such a relaxing impact on people that it can often replace modern medicine for sleep issues. Nervous system: Lavender essential oil has a calming scent which makes it an excellent tonic for the nerves and anxiety issues. Therefore, it can also be helpful in treating migraines, headaches, depression, nervous tension and emotional stress. The refreshing aroma removes nervous exhaustion and restlessness while also increasing mental activity. It has a well-researched impact on the autonomic nervous system, which is why it is frequently used as a treatment for insomnia and also as a way to regulate heart-rate variability. One study showed that people taking tests showed a significant decrease in mental stress and anxiety, as well as increased cognitive function when they inhaled lavender oil and rosemary oil before taking the exam! Have you ever noticed how dry your skin can feel after a shower with commercially prepared soap? Most over the counter soaps have a ph around 9 or 10, which is very high, and similar to bleach or household cleaners. This high ph can damage or neutralize the natural acid mantle on your skin and leave it unprotected from bacteria, infection, allergic reactions and dehydration. 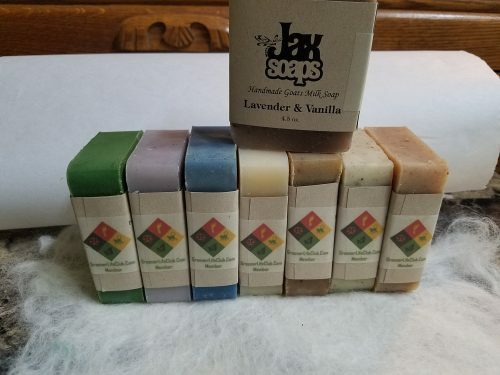 Jaxsoaps are natural, gentle soaps, free of harsh additives and ph balanced naturally to keep the acid mantle intact and leave your skin soft and healthy, with the added benefits of essential oils. All of Jaxsoaps cold process soaps are handcrafted in small batches, one recipe at a time, using only the finest natural ingredients. Each recipe may include different combinations of the saponified oils of Coconut, Soy Olive, Palm Kernel, Palm, Castor, Sweet Almond and nuturing butters such as Shea, Mango and Cocoabutter. The soaps are fragranced using High quality essential oils and the finest fragrance oils. Essential oils are also considered and used for the specific healing or nurturing qualities believed to be inherent in them. Glycerin is a natural byproduct of the saponification process and remains in all Jaxxsoaps. You will not find this to be true of many commercially prepared products. There are no petroleum products in anything Jaxsoaps that touched your skin! Use Jaxsoaps and be comfortable in your own skin! ~Jaxsoaps ships worldwide. International shippers are responsible for any duty or addition charges associated with international shipping. 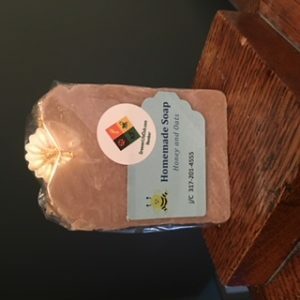 ~Please remember, all Jaxsoaps products including Soap, Candles and Alpaca fiber products are all handmade and will have variations, as each product is essentially one of a kind! ~All shipments will include a bonus!